Three former executives of Olympus have been given suspended jail terms for their roles in an accounting scandal. Former chairman Tsuyoshi Kikukawa and executives Hisashi Mori and Hideo Yamada pleaded guilty last year to charges of falsifying accounts to cover up losses of $1.7bn (£1.1bn). 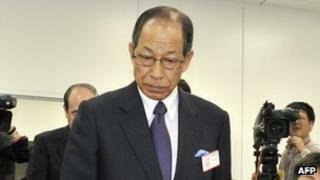 Olympus was ordered to pay 700m yen ($7m; £4.6m) in fines for its role. The scandal is one of the biggest financial frauds in Japan's history. It came to light in 2011 after then chief executive Michael Woodford was dismissed from his post after challenging Mr Kikukawa and the board over suspiciously large payments related to acquisitions. That led to an investigation being launched, which revealed a cover-up of losses dating back to the 1990s. Mr Kikukawa, former executive vice-president Mr Mori and former auditing officer Mr Yamada were arrested in February last year and later indicted on suspected violation of the Financial Instruments and Exchange Act. The scandal also hit Olympus shareholders, as the firm lost almost 80% of its value in the aftermath of the revelations. However, there have been signs that the firm may be recovering from the scandal. It has announced a major overhaul and entered into an alliance with electronics giant Sony to try to boost its share of the global medical equipment market. The company has returned to profit and its shares have also recovered most of their losses.